After the arctic conditions on this mornings school run I thought I would cheer myself up with a bunch of tulips. This card can be adapted for any occasion. I started by cutting a piece of pink and a piece of white card 5.5 inch square. Across the bottom of the pink card stamp your sentiment, place the white card over the top of the pink one and mark on the white card there the sentiment begins. Now tear across the white card, so that when it is on the top of the pink card you can see the sentiment and there is a slight border. 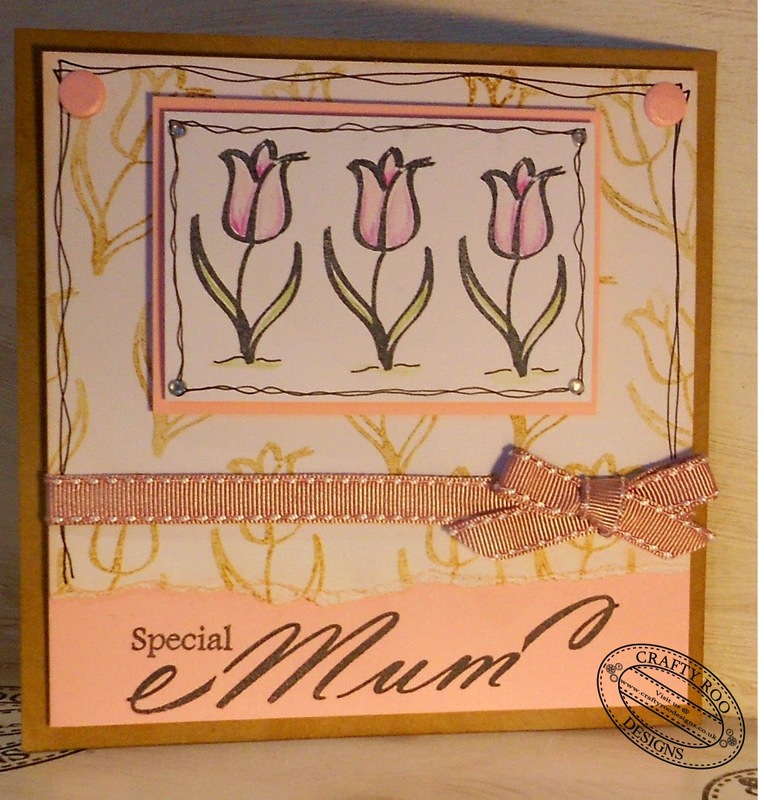 Next stamp the tulips all over it , distress around it and attach it to the pink card. Doodle around the three un torn edges of the white card, attach some ribbon across the center of the card and attach it to a 6 inch square Kraft card. Onto a small piece of white card stamp the tulip 3 times, colour them in doodle around the edge and amount onto pink card. Attach this onto the base card. Finally Add two card candis to the top corners of the white card and a clear gem on each corner around the tulips.